*Not offered in all areas. Call for availability. Why choose Ritter? We offer the fastest internet in your area, reliable cable TV service without disruptions during storms and customer service that’s close to home in Arkansas, Tennessee and Missouri. Whether you're streaming videos or working from home, our internet is fast enough to handle all of your household needs! From basic packages to all-inclusive access, we bring the best entertainment to your living room at the best value. We make it easier for you to stay connected and stay safe in your home with unlimited local and long-distance phone service. 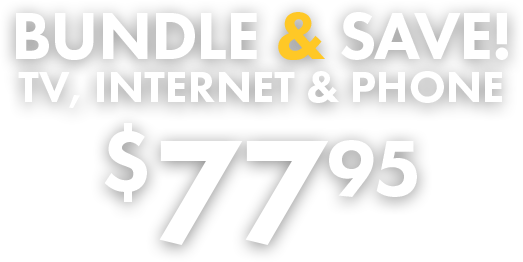 Simplify your life and get the best deal on internet, TV and phone services by bundling them together! No more arguing over the remote! With the one-touch DVR capabilities of the Ritter Whole Home Solution, you can control what to record and when to watch it. Record up to six of your favorite shows at once and watch them in up to five rooms! "I want to express my gratitude to Mitch and his crew for going above and beyond when installing my phone & cable TV. They went to extraordinary lengths and the crew seemed genuinely happy to help us. Such excellent service and kindness from a utility company is rare. Mitch and his workers should be commended." "The customer care rep. who assisted me went above and beyond to help me set up a new account today! Her customer service was excellent." Cracked screen? Mechanical issues not covered by your manufacturer's warranty? No worries - we've got you covered! Keep your personal information and files safe wherever you are with comprehensive, cloud-based web security, virus protection and backup.